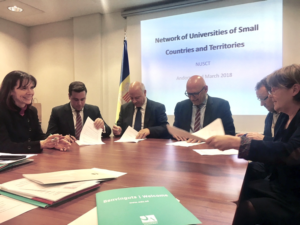 On the initiative of the University of Andorra (UdA), several representatives of the universities of small countries and territories met on March 2, 2018 at the campus of Sant Julià de Lòria with the aim of establishing a network of collaboration , which has been provisionally called in English under the name Network of Universities of Small Countries and Territories (NUSCT). The academic institutions represented at the meeting share characteristics and specificities, and work in similar sociopolitical and economic contexts. For this reason, they want to meet commonly in the international higher education forums, they want to exchange good practices, as well as deepen collaboration opportunities and share strategies to improve the professional insertion of graduates. 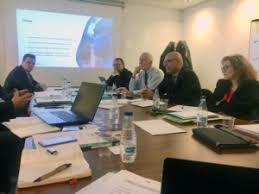 The first meeting was attended by the universities of Andorra, Gibraltar, Greenland, Liechtenstein, Malta and San Marino. The universities of Iceland and Monaco have also shown their interest.